To help golfers of all abilities cultivate a lifelong love for the game. Born and raised in Australia, Mark Smith has extensive experience in teaching golfers of all abilities from professional to beginner. Mark's first professional playing achievement was in winning his home Australian State PGA Trainee Championship in 1993 & 1994. With numerous Pro-Am victories following he quickly established himself as a valued member of the profession. Mark realized in his early days as an Australian PGA Golf Professional though that his passion was in teaching. Mark's first notable success as a coach was when he was called up to coach at state level following his success in coaching a work colleague to National selection for the first time. Mark's thirst for more knowledge and experience landed him in London where he took up a coaching role with a long time mentor Chris Meadows at the Regent's Park Golf & Tennis School. 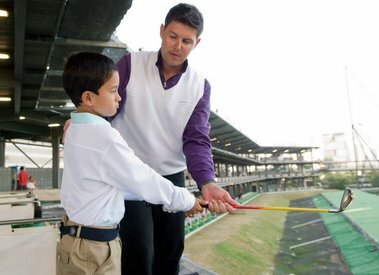 Mark's first role in Hong Kong was to set-up the Whiterock Golf Academy in 1999. Mark then stepped out and formed his own private coaching service as a freelance instructor. Mark's first accomplishment in Hong Kong came when he coached a student from beginner to Mission Hills Ladies Club Champion. Soon followed the Hong Kong Golf Club ladies Championship with another lady student, a maiden victory of this event. A few years later it was the Xiii Golf Club men's Championship then perhaps the biggest achievement of his career in coaching a young prodigy to a 3rd place finish at the 2012 USKids World Championship. Mark's winning formula consists of a holistic approach to golf instruction using the latest technologies in golf coaching including computerized swing analysis, 3D motion analysis and club fitting to enhance his coaching programs. Mark's online Academy with "Coach Now App"allows him to offer a very personalized tailored training program with a personal locker set up for video transfer of lesson content, video analysis and swing capture. Have Mark tailor an instruction program to match your specific objectives. Mark uses Coach Now Coaching + Video Analysis Application with high speed video capture together with ball flight launch monitor data from GolfZon to optimize your learning and improvement program. An online locker is set-up for each and every student for maximum communication efficiency. Your online locker is updated with fresh content relative to YOUR learning or improvement cycle upon completion of each lesson.